Mark's affinity with the guitar began at the tender age of 6. His early classical training resulted in a number of junior solo and group performances. By the age of 15, Mark was playing live with his first rock band and throughout the 80s and 90s, his experiences as lead guitarist expanded considerably with regular live performances in different styles (blues, country, funk, rock and disco). This era contained many great experiences, including playing at some great venues such as the Cornwall Collesium, and supporting many well known acts including Sam Brown, Showaddywaddy, Bucks Fizz and Marmalade. Mark's passion for Flamenco grew upon meeting Jon Salfield, South West Flamenco virtuoso, who became his teacher. Mark has played both solo and with other artists at numerous venues throughout the UK and across the globe combining his love of music and travel - see performance highlights. His repertoire has its roots in romantic, Spanish guitar and traditional Flamenco music, often spiced with Arabic and Latin sounds. Mark brings his own dynamic compositions to the mix as well as his arrangements of popular music by artists such as Gipsy Kings, Jesse Cook, Eagles and The Beatles. His music can be sampled on the audio page. 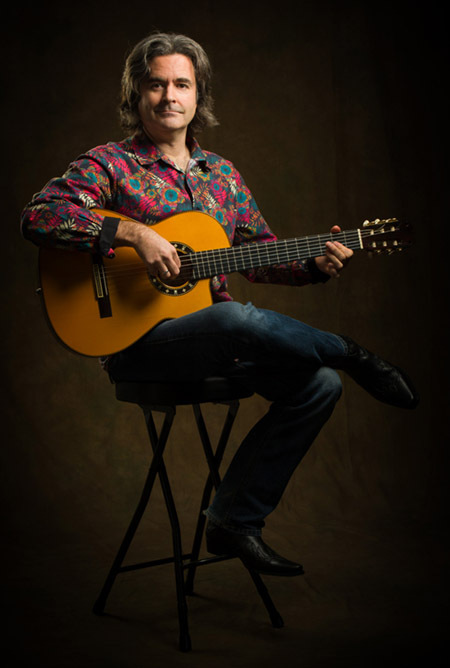 Mark also writes his own music, often collaborating with other musicians, and drawing on his love of Flamenco, Latin and Arabic styles of music for inspiration. 'Passionata, 'Exotica', 'Ojos de la Tierra' and 'Inspiration' and 'Mandala' are all available here on this website. Mark's "Manadala" CD won an award for "Best album of 2016" in the Acoustic Guitar category, and in September and October 2016, Mark performed in California with LA World Fusion band, "Incendio". Mark's music is also available to download from iTunes, Amazon and CDBaby. For further information or bookings: Email Mark or call 01503 230832 or 07970 052329.